Bear-baiting in the 17th century. Bear-baiting is a blood sport involving the worrying or tormenting (baiting) of bears. It may involve pitting a bear against another animal. Bear-baiting was popular in England, until the 19th century. From the sixteenth century, many bears were maintained for baiting. In its best-known form, arenas for this purpose were called bear-gardens, consisting of a circular high fenced area, the "pit", and raised seating for spectators. A post would be set in the ground towards the edge of the pit and the bear chained to it, either by the leg or neck. A number of well-trained fighting or baiting dogs, usually Old English Bulldogs, would then be set on it, being replaced as they got tired or were wounded or killed. In some cases the bear was let loose, allowing it to chase after animals or people. For a long time, the main bear-garden in London was the Paris Garden, that section of the Bankside lying to the west of The Clink, at Southwark. Thursday, the fourteenth of July, and the sixth day of her Majesty’s coming, a great sort of bandogs [mastiff] were then tied in the outer court and thirteen bears in the inner . . .
Well, the bears were brought forth into the court, the dogs set to them, to argue the points even face to face. They had learned counsel also on both parts, what may they be counted partial that are retained but to one side? I know not. Very fierce, both one and the other, and eager in argument. If the dog in pleading would pluck the bear by the throat, the bear with traverse would claw him again by the scalp, confess and a list, but avoid it could not that was bound to the bar, and his counsel told him that it could be to him no policy in pleading. Therefore, with fending & proving, with plucking and tugging, scratching and biting, by plain tooth and nail on one side and the other, such expense of blood and leather [skin] was there between them, as a months licking (I think) will not recover, and yet remain as far out as ever they were. It was a very pleasant sport, of these beasts, to see the bear with his pink eyes leering after his enemies approach, the nimbleness and wayt [wait] of the dog to take his advantage, and the force and experience of the bear again to avoid the assaults. If he were bitten in one place, how he would pinch in another to get free, that if he were taken once, then what shift, with biting, with clawing, with roaring, tossing and tumbling, he would work to wind himself free from them. And when he was loose, to shake his ears twice or thrice with the blood and the slather about his physiognomy, was a matter of goodly relief. Variations involved other animals being baited, especially bulls. 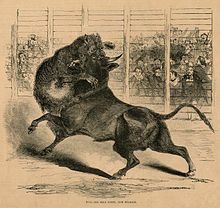 Bull-baiting was a contest which was similar to bear baiting in which the bull was chained to a stake by one hind leg or by the neck and worried by dogs. The whipping of a blinded bear was another variation of bear-baiting. Also, on one curious occasion, a pony with an ape tied to its back was baited; a spectator described that "... with the screaming of the ape, beholding the curs hanging from the ears and neck of the pony, is very laughable". Attempts to end the entertainment were first made in England by the Puritans, with little effect. The deaths of a number of spectators, when a stand collapsed at the Paris Gardens on 12 January 1583, was viewed by early Puritans as a sign of God's anger, though not primarily because of the cruelty but because the bear-baiting was taking place on a Sunday. One bear named Sackerson was written into in a Shakespearean comedy The Merry Wives of Windsor. 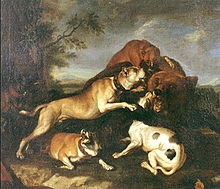 By the late 17th century "the conscience of cultivated people seems to have been touched", but it was not until 1835 that baiting was prohibited by Parliament by the Cruelty to Animals Act 1835. The ban was soon extended across the Empire. In India, towards the end of the 19th century, Gaekwad Sayajirao III of Baroda arranged a fight between a Barbary lion and Bengal tiger, to determine whether the lion or tiger should be called the "King of the Cat Family." The victor then had to face a Sierran Grizzly bear weighing over 1,500.0 lb (680.4 kilograms), after the Gaekwad was told that the cat was not the "King of Carnivorae." Bear baiting has been occurring in the Punjab and Sindh provinces of Pakistan, since 2004. The events are organized predominantly by local gangsters who own the fighting dogs. During the event the bear will be tethered to a rope 2.0–5.0 m (6.6–16.4 feet) long in the centre of an arena to prevent escape. Bears' canine teeth are often removed and their claws may be filed down giving them less advantage over the dogs. Each fight lasts around three minutes. If the dogs pull the bear to the ground they are said to win the fight. Bears usually have to undergo several fights during each day’s event. Bears are illegally sourced by poaching. Asian black bears and brown bears are known to be poached in Pakistan and used in bear baiting. Asiatic black bears are listed as vulnerable on the World Conservation Union's (IUCN's) Red List of Threatened Animals. The capture of bear cubs is prohibited across three provinces of Pakistan by: the North West Frontier Province Conservation and Management Act (1975); the Punjab Wildlife Protection, Preservation, Conservation and Management Act (1974); and the Sindh Wildlife Protection Ordinance (1972). Bear baiting was banned in Pakistan by the Prevention of Cruelty to Animals Act (1890). Pakistan's wildlife authorities are working with animal welfare groups to eradicate the events, with some success. The Bioresource Research Centre, a Pakistani wildlife group working to end bear-baiting, uses Islamic teachings to encourage mosques in areas where baiting occurs, to add an anti-cruelty message to their Friday Khuṭbah (Arabic: خُـطْـبَـة‎, Sermon). Depending on the context, though the Quran does not directly forbid the baiting of animals, there are restrictions on how people can treat them, and it is outlawed in certain hadiths. Kund Park Sanctuary was opened in 2000 by World Animal Protection to provide a home for bears confiscated by the wildlife authorities and NGOs working to eradicate bear baiting in Pakistan. However, during the 2010 Pakistan floods Kund Park was destroyed and all but three of the 23 bears there died. The survivors were moved to a newly constructed sanctuary in Balkasar Bear Sanctuary. As recently as 2010, illegal bear-baiting was practiced publicly in South Carolina. All such public exhibitions have been shut down as of 2013. Storer and Trevis (1955) mentioned the account of Albert Evans, who said that he saw an uncommon incident at a Plaza de Toros in Veracruz, Mexico, in January 1870. A bear called 'Samson' dug a hole so large that it could hold an elephant, before using its large paws to carry and throw an opposing bull headfirst into the hole, paw-swipe its side till its breath appeared to have been half-knocked out of its body, and then use one paw to hold the bull, and the other to bury it alive. Bear baiting is banned in 18 of the 28 states that allow bear hunting. It persists... in Alaska, Idaho, Maine, Michigan, Minnesota, New Hampshire, Utah, Wisconsin, and Wyoming. For instance, in Wisconsin in 2002, hunters killed 2,415 bears; those using bait accounted for 1,720 of the kills. In Maine, hunters killed 3,903 bears in 2001, and baiters took 3,173 of the animals. Author Washington Irving described vaqueros setting a bear against a bull, in his 1837 book The Adventures of Captain Bonneville. In this "favorite, though barbarous sport" in Monterey, a bear and a bull would be caught from the wild and put together in an arena in a fight to the death. Congleton, an English town notorious for its bear-baiting. ^ a b c d e f Tracy Irwin Storer; Lloyd Pacheco Tevis (1996). California Grizzly. University of California Press. pp. 42–187. ISBN 978-0-520-20520-8. Retrieved 23 March 2016. ^ a b Brown, David E. (1996). The Grizzly in the Southwest: Documentary of an Extinction. University of Oklahoma Press. Retrieved 25 March 2016. ^ "Elizabethan Bear & Bull Baiting". Elizabethan-era.org.uk. 17 May 2007. Archived from the original on 27 October 2010. Retrieved 19 October 2010. ^ a b "Bear-baiting". Encyclopædia Britannica. 3. Encyclopædia Britannica Company. 1910. p. 575. Retrieved 15 February 2007. ^ Field, John (1583). A Godly exhortation ... showed at Paris Garden. Robert Waldegrave. ^ "In Search of Shakespeare: Bear Baiting". PBS.org. 2003. Retrieved 26 September 2014. ^ "His Highness Sayajirao Gaekwad III". Gaekwadsofbardoa.com. Retrieved 8 April 2017. ^ Lawson, Alastair (10 December 2011). "Indian maharajah's daring act of anti-colonial dissent". The BBC. Retrieved 10 December 2011. ^ "Lion against tiger". Gettysburg Compiler. 7 February 1899. Retrieved 30 January 2016. ^ Lion against tiger. The Baltimore Sun. 26 January 1899. p. 3. Retrieved 30 January 2016. ^ See Fakhar -i- Abbas (2007) Baiting and Sanctuary Maintenance of Bears in Pakistan: a status Report Archived 20 March 2009 at the Wayback Machine in BIERZ 2007: Bear Information Exchange for Rehabilitators, Zoos & Sanctuaries. Retrieved 6 August 2008. ^ Nawaz, M.A. (2007) Status of the brown bear in Pakistan, Ursus, [online], 18:1. Retrieved 6 August 2008. ^ a b Four bears saved in local network success Archived 12 August 2008 at the Wayback Machine (9 July 2007), WSPA website. Retrieved 6 August 2008. ^ "The IUCN Red List of Threatened Species". IUCN Red List of Threatened Species. Retrieved 15 November 2018. ^ See Points 1 and 5 of the Third Schedule of the Act, from Food and Agriculture Organization of the United Nations legal website. Retrieved 6 August 2008. ^ See Mammals in category 1 of the Act[permanent dead link] (those protected throughout the year). Retrieved 6 August 2008. ^ See Point 1 of the Second Schedule of the Ordinance Archived 15 June 2008 at the Wayback Machine. Retrieved 6 August 2008. ^ See 3(a) and 6B(6) of the Act, from Food and Agriculture Organization of the United Nations legal website. Retrieved 6 August 2008. ^ Pakistan halts bear-baiting event (18 May 2005), BBC News website. Retrieved 6 August 2008. ^ Religious based awareness, BRC website. Retrieved 6 August 2008. ^ Susan J. Armstrong; Richard G. Botzler. The Animal Ethics Reader. Routledge (UK) Press. pp. 235–237. ISBN 0415275881. ^ Pakistan's baited bears wait for rescue (4 January 2001), BBC News website. Retrieved 6 August 2008. ^ History of Balkasar Bear Sanctuary - Pakistan, YouTube. 13 August 2010. Accessed 25 June 2014. Wikisource has the text of a 1911 Encyclopædia Britannica article about Bear-baiting. Bear Baiting In Pakistan. Is It Still Happening?